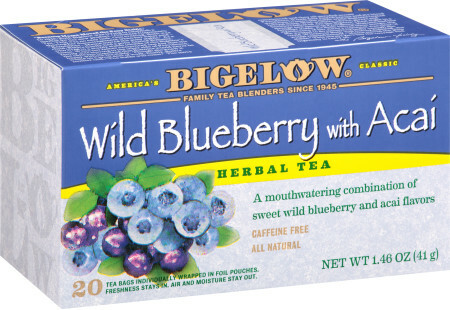 Give your salads a delicious lift with this vinaigrette made with Bigelow's Blueberry and Acai Herb Tea. Pour the vinegar into a small microwave-safe bowl, and cook on high for 1 minute, or cook in a saucepan on medium heat, until bubbles are visible. Remove, add the teabags, and steep for 5 minutes. Remove the teabags to a small strainer and, using the back of a spoon, press as much liquid as possible back into the bowl. Stir in the honey and mustard, then pour the mixture into an electric blender or a food processor. Add garlic and salt. Slowly drizzle the oil while the machine is running until it is smooth and creamy. Cover and refrigerate if not using right away.